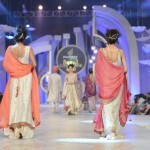 The designer has even placed by long shirts with the setting of the churidaar pajamas as well. Each and every single collection dress has been wonderfully adorned in the company of the stone work, zari, motifs, dabka and embroidery as well. She began as a painter and then started doing hand work for the decoration of fabrics. After that, she became a couturier. Many people liked the work on the dresses designed by this designer. The work was done by hand as well as by machine. 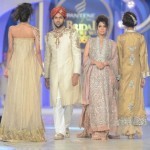 Apart from designing bridal wear clothes, Mifrah Gul designs sherwanis for men.color schemes put in inside the bridal clothes have been captivatingly much colorful looking that is even included with the soft and light shades as well adding with the red, white, blue, pink, purple, yellow, black, magenta and so on. 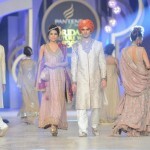 In this article we will give a look at Mifrah latest collection at Pantene Bridal Couture Week 2013.